The brogue or man shoe has been in for a while and this trend isn’t going anywhere soon, but so many women are unsure of how to wear it. In this video, I’m going to show you 3 ways of wearing brogues. The brogue or man shoe has been in for a while and this trend isn’t going anywhere soon, but so many women are unsure of how to wear it. 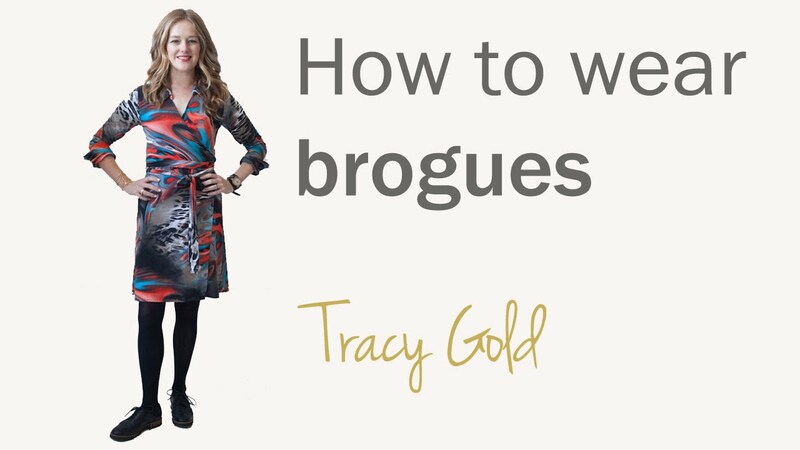 In this video, I’m going to show you 3 ways of wearing brogues. Brogues can be a chic and stylish pair of flats, offering comfort and style. 1. It’s all about mixing masculine and feminine pieces: One of the easiest ways to wear a brogue is to wear them with a dress or girly skirt. If you want to elongate your leg, either wear it with hemline that ends above your knee. To further elongate your legs, wear a pair of tights in the same colour as your shoes. 2. Wear them with slim or skinny pants or jeans. Make sure that you shorten your pant length so it shows off your gorgeous brogues, but not too much that they shorten your legs. The eye goes to where there is skin so rolling them up too high can shorten your length. 3. Wear them with a pair of 70’s wide leg. This look works really well if you are tall. But if not, the pointy toe brogue will work to elongate your legs. Make sure you pant length touches your shoe, but doesn’t bunch at the bottom. This will create an elongated effect.